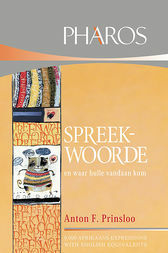 The second edition of Spreekwoorde en waar hulle vandaan kom is completely revised with roughly 3000 new entries. Two thirds of these represent origins from mainly old Dutch sources. While many expressions and proverbs are obsolete, they are still found in texts. Meanings of these expressions and proverbs would be unavailable to readers who do not have access to older dictionaries. However, Spreekwoorde en waar hulle vandaan kom fills this gap. In addition, it is a handy reference work for Afrikaans and English users: Afrikaans expressions are not only explained. For each Afrikaans expression, its English equivalent or meaning is provided. For the first time, Spreekwoorde en waar hulle vandaan kom also includes information about intensive forms, such as so nors soos ’n buffel, as well as a number of commonly used Latin and French expressions, such as raison d'être and joie de vivre.